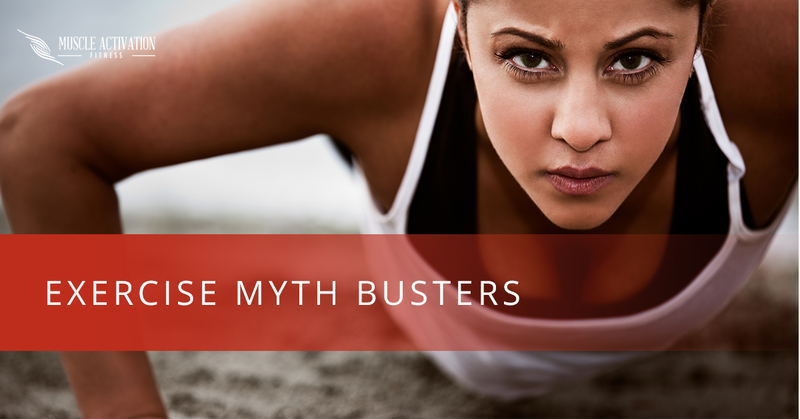 There are many myths in the exercise world now-a-days. We tend to answer many of these myths when we have clients here at Muscle Activation Fitness. Today, I am going to be giving a review of four myths that were directed towards women and weight training by ACE Fitness called the 4 Myths About Strength Training for Women. I feel that the first two myths are one and the same, and one that I hear so many times from women during our assessments and consultations here at Muscle Activation Fitness. The myths say that women should not lift any heavy weight and that lifting heavy weight will make them bulky. These horrible lies have resulted in many women thinking that if they even look at a weight that they will instantaneously become the next Mr. Olympia! What is so funny is that if people really thought or knew how much hard work (and sometimes drugs and flawless nutrition) for months and years that it takes for a woman to get “bulky,” they would not have this fear of lifting heavy weights! Women have a different physiology than men when it comes to how easily they can gain muscle. Women have much less testosterone which makes it much more difficult to add muscle. Resistance training can help women produce human growth hormone (HGH), which will help metabolize fat more effectively. So, where the initial myth came from will always boggle my mind! The myth that says aerobic exercise is the most effective way to burn fat is almost, if not as common, as the first two myths we discussed. This myth gained scientific backing when it was found that exercising in a “fat-burning zone” occurs during low-intensity physical activity. The problem is that you are in this zone when you are sitting here reading this article (unless reading my words makes your heart start to race with anticipation). Using this method is not a bad option in burning calories, but high intensity interval training (short bursts of sprints with short rests and repetition) can lead to a greater total amount of calories burned during a workout. The same concept can be utilized during a weight training program which will result in more calories burned which will give great results for weight loss. It will also cause an increase in lean muscle mass which will increase the total amount of calories burned while at rest. We use Muscle Activation techniques to make sure each muscle is working effectively so that, in the long run, your body can perform its best to gain muscle. Myth four states that a combination of light weights and high repetitions is the best way to tone up. The problem with this thought is that most people think that has something to do with the number of reps only. For a muscle to increase in size to improve definition, it has to reach failure or near maximal failure. This can be done using light weights (just takes more reps) or heavy weights, but the main thing that has to happen is that the muscle targeted has to reach near maximal fatigue! This is the part that most trainers and gym goers miss. I hope this article has helped de-bunk some of the myths that are out there related to men and women alike in regards to strength/resistance training. If you need help learning more about how to exercise effectively to get the greatest body possible come visit us at Muscle Activation Fitness to feel, move, and perform your best.